How to Travel With a Scared Cat? It’s hard enough to get a cat to the vet, let alone across the country or the world. If your cat becomes a nervous, yowling, possibly scratching and biting wreck on the road, you undoubtedly want to make travel less scary for him―and you. As Elizabeth Palermo of LiveScience points out, domestic cats are descended from solitary wildcats dependent on routines and territory for survival, so unfamiliar places are scary. Whatever your mode of travel, you can make the trip less distressing by keeping this need for familiarity in mind. Making the trip feel as safe and homelike as possible is key. Any trip with a cat will require a carrier. A loose cat might jump out a car window or flee into the crowd at an airport; a cat darting under your pedals or over your steering wheel could cause an accident. Cats like to hide in dark, enclosed, but comfortable spaces. A carrier that makes a good hiding spot will make travel much less stressful, especially if you get the cat used to the carrier before you set off. A travel carrier should be about one and a half times the cat’s size unless you need to include food and water bowls for an especially long trip or a litter box and bed for an even longer one. If you are traveling with multiple cats, have a separate carrier for each if at all possible. Cats are very uncomfortable sharing a carrier and sometimes will attack each other even if they normally get along―which will make the next trip even scarier. Cat carriers come in various styles: soft fabric, hard plastic, wheeled like a rolling suitcase. Certain features frighten some cats, like loud metal snaps or the noisy rattle of a wheeled carrier rolling over the ground. Multiple doors can be reassuring and practical; some cats are more willing to enter a carrier through the top than through the front door. Cats feel safer with their backs against a surface. Cats are less afraid in carriers that are familiar. Lining the bottom of the carrier with a towel your cat is used to lying on will make it smell like home. Freshly dried, fluffy towels are also popular, Middlebrook Animal Clinic observes. Middlebrook Animal Clinic also recommends spraying the inside of the carrier with Feliway, a synthetic version of the pheromone happy and safe cats release, to make it more welcoming. Humans can’t perceive Feliway, but cats find it reassuring. Making the carrier a normal part of the cat’s environment at home will also reduce a cat’s fear. Feeding the cat in the carrier, leaving it in the cat’s space with a favorite blanket, or giving the cat toys inside can create positive associations. Some veterinarians, like Dr. Carlo Siracusa, suggest having two carriers: one for travel and one for trips to the vet’s office. This will prevent the cat from associating the travel carrier with the discomfort of a vet visit. The Catalyst Council’s YouTube video “Cats & Carriers: Friends not Foes” demonstrates the various types of carriers available and techniques for carrier training. If you haven’t had time for carrier training―or your cat still gets balky when it’s time to leave―you’ll need to coax the cat into the carrier. Put your cat in the bathroom or another enclosed space with no hiding places, then bring in the carrier. If your cat doesn’t let you pick her up, lure her in with food or a toy. If your carrier doesn’t have a removable top, stand the carrier up on end against a wall with the opening facing upward. Lift your cat and gently place him inside feet first, then close the door and carefully lower the base of the carrier to the floor. Be sure you don’t let the carrier fall over in the process since this is loud and startling. If your cat flails and scratches when you try to get her into a carrier, you may need additional protection for both the cat and yourself. Wrapping a cat in a towel beforehand will make injuries less likely. Pet health and safety coach Arden Moore demonstrates this “purrito” technique for moving a reluctant cat in this YouTube video, first placing the cat on a bath towel and then wrapping it around the cat’s body, front paws, and back paws. Once you’ve rolled the cat into the “purrito,” you can gently lower her into the open carrier, where she will unroll herself. Just as it’s best to get a cat accustomed to a carrier before a trip, it’s best to get the cat accustomed to the car. The Catalyst Council recommends introducing the car step by step, first letting the cat sit briefly in a parked car, then starting the engine, then driving around the block, then progressively longer trips. The Middlebrook Animal Clinic recommends putting lavender sachets in your car to relieve travel anxiety, as well as playing gentle classical or instrumental music. If these also calm you, even better; calm caretakers are reassuring for cats. Since cats find dark enclosed spaces calming, Chico Hospital for Cats recommends a thin cover over the carrier. A thick blanket will be too hot due to an anxious cat’s increased body heat. If someone else is driving, sitting next to your cat and talking to her can distract and reassure her, Palermo suggests. 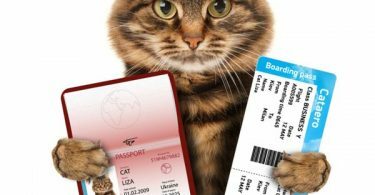 Dr. Robin Downing warns you to make sure your airline allows cats in the cabin, which may be less scary than flying cargo. Make sure you know the dimensions of the area under the seat and that your carrier will fit. If you aren’t sure the airline will allow your carrier, take it to the airport before your departure date and ask the airline staff. Reduce your own anxiety―especially by making sure you have a health certificate for the cat, vaccination records, and any other paperwork you need. 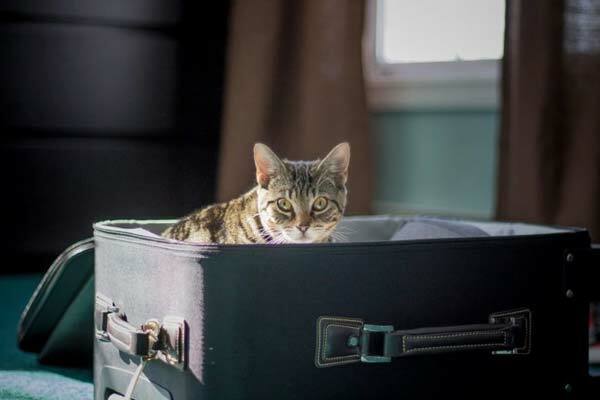 It’s especially important to practice getting the cat in and out of the carrier before flying; you’ll need to take the cat out for security screening. Practice using a harness as well, since cats easily squirm out of collars, and reward your kitty with treats. If your anxious cat is very noisy, the cat may be bumped to cargo or you may even be asked to leave the plane, so you may need extra precautions for flying. In addition to Feliway, as mentioned above, Dr. Robin Downing suggests calming a particularly anxious cat with a Thundershirt swaddling garment. If necessary, a vet can prescribe anti-anxiety medication like gabapentin or buprenorphine. 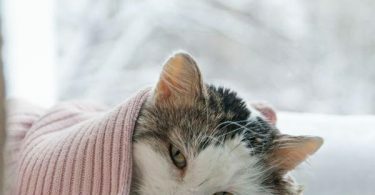 Lorazepam is another possibility, as is the amino acid supplement Anxitane, as Dr. Jeff Nichol suggests―but avoid the tranquilizer acepromazine, which appears to reduce agitated behavior but does not actually relieve the cat’s anxiety. If you’re going to use medication, do a “trial run” if possible; this way any side effects or unexpected reactions will show up in a situation where you’re better equipped to deal with them. However, some veterinarians, such as Dr. Siracusa, actually recommend flying cats in cargo, since the space under a seat is so confined. A cargo crate allows for a bed, food and water bowls, and a litter box, which can make longer flights more comfortable. However, the cargo hold is loud, more turbulent than the cabin, and full of strange sights and other animals. Hot or cold temperatures or poorly secured items occasionally injure cats there, though serious medical problems are uncommon. The cabin also has the advantage of allowing you to distract your cat from the flight by talking. Bringing your cat’s bed or something else that smells like home will help you create a familiar safe haven wherever you’re staying. You can even line a hotel bathtub with bedding. Keeping the cat only in one room of any house you visit, preferably the one where you are sleeping can also reduce the amount of intimidating new territory for the cat to confront. When you get the chance, visit her to remind her that you’re still there and still caring for her. Some cats are reluctant to drink water that tastes odd to them, so bringing a gallon jug of the water your cat is used to can make her more comfortable. Cat behaviorist Pam Johnson-Bennett notes that cats feel safer when no one can see them and they can’t be ambushed, so setting up hiding places will make an unfamiliar place less threatening. Johnson-Bennett recommends “donut” beds with high sides, partially enclosed perches on cat trees, or the ever-popular cardboard box, preferably lined with something soft. 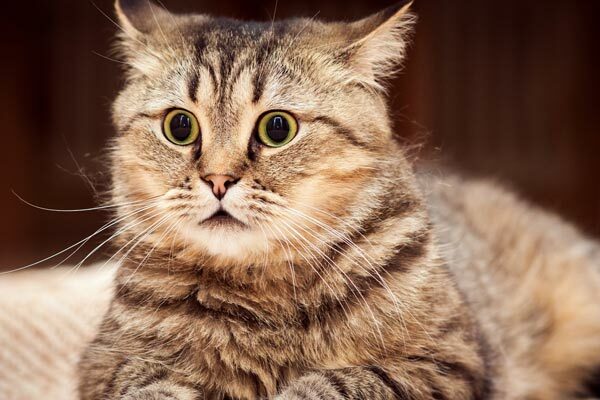 Don’t force a frightened cat to interact with people. A cat without choices will be scared and unhappy, but a cat offered the option may decide to greet strangers or explore a new environment. Reward your cat for exploring and interacting by feeding treats, on chopsticks if the cat won’t eat from your hand. If your cat is hiding, you can still play with him by gently flicking around a fishing pole toy. Create safe paths from the cat’s hiding place to food, litter box, and a scratching post with paper bags opened at the bottom, large cardboard tubes, or the soft fabric tunnels available from pet supply shops. Cats feel safer in high perches where they have a good vantage point and ambush is unlikely. Vertical space also means more territory, which is especially calming for multiple cats who feel competitive with one another. Puzzle feeders and solo toys can also interest a cat in a new environment while you’re elsewhere. Enrichment and fun will associate positive feelings with the new space and prevent boredom, which Johnson-Bennett notes is also stressful. However, make sure the cat’s space is not loud, chaotic, or unpredictable. Since cats hate dirty spaces, Johnson-Bennett highly recommends you reduce anxiety―and messes outside the litter box―by scooping the litter twice a day. No doubt your hosts will also appreciate this diligence! If you’re traveling with more than one cat, you may need separate food and water bowls, litter boxes, and beds if the cats get competitive. Cats hunt alone and are often anxious about not having resources to themselves. If you’re staying with hosts who have cats, Johnson-Bennett urges caution about introducing the cats to one another; this can be stressful even without obvious aggression. She recommends you let the cats hear, then smell, then see, then touches each other. Make sure each cat has a private “sanctuary” area for escape, with all the necessities: food, water, hiding spot, scratching post, and toys. Introduce two cats to one another’s scents by rubbing a clean sock gently on each cat’s face, then putting each sock in the other cat’s territory. Reward your cat for approaching, sniffing, or touching it. If the cats are reluctant to interact or leave their hiding places, start putting the food bowl gradually closer and closer to the door. They will associate food with pleasure and safety. Open the door to the other cat’s space a crack during feeding, not letting either cat through but allowing the cats to see one another. Once they are comfortable with this, you can open the door fully. Reward positive interactions―or even lack of negative ones. Play with both cats simultaneously, using two toys so they don’t feel competitive but can still see one another playing. Even if your cat is normally an indoor/outdoor cat, don’t leave your cat outdoors in a new area without access to a safe hiding place, Johnson-Bennett warns. This is frightening, especially if she’s locked out all day. Looking at every aspect of a trip from the perspective of a cat’s need for familiarity and safety―carrier, car or plane, and destination―will mean a better trip both for your cat and for you.